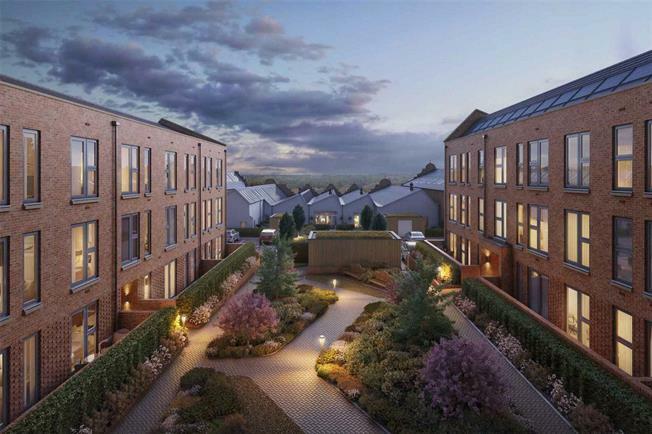 2 Bedroom Flat For Sale in St. Albans, Hertfordshire for Asking Price £415,000. An excellent 2 Bedroom, 2-Bathroom apartment offering open-plan living throughout. Both master and second Bedrooms are fantastically proportioned and a convenient storage cupboard completes the home. Hansell House, part of Taylor Wimpey's Beaumont Gardens development, is a refurbished Grade II listed building and forms part of the historic Nicholson & Co garment factory. Incorporating original decorative design, the building has created a collection of 1 & 2-Bedroom apartments and Duplexes. Situated in the historical and popular city of St Albans nestled between the M1, A1 and M25 with rail links into the capital together with superb local shopping and inner city entertainment. - Luxury modern Kitchen with Stone worktops, Zanussi appliances to include single oven, fridge/freezer, washer dryer and dishwasher. Stainless steel splashback. 4 ring halogen hob. Chrome Kitchen tap, 1 ½ bowl with drainer, USB charging point, Under cabinet LED strip lighting, Chrome low-energy downlighters. - White sanitaryware Bathroom with half-height tiling to walls with sanitaryware. Chrome mixer tap, Chrome bath mixer taps with rinse shower. Heated chrome towel radiator. Chrome low-energy downlighters. - White sanitaryware En-suite/Shower room with half-height tiling to walls with sanitaryware, full-height tiling to shower enclosure, Chrome mixer tap, Heated chrome towel radiator, Chrome low-energy downlighters, Chrome thermostatic shower. - Lighting to comprise of wall, pendant and spot lights. - Wiring for satellite to Living room, Master Bedroom and Bedroom 2. BT points to Living Room, Master Bedroom and Bedroom 2. Mains operated smoke detectors with battery back-up. - NHBC 10-year Buildmark Policy. To arrange a viewing, please contact Preston Bennett New Homes on 0208 954 8626. A1, M1 and the M25, and the capital easily in reach, the region has something for everyone. Central for shopping, with the city centre just 1.4 miles away, living is easy. Commuters will enjoy the rail links from St Albans City station, 1 mile away, to St Pancras and Blackfriars which can be reached in 33 minutes, whilst local parks, schooling, and city entertainment at the cinema, theatre, nightclubs and pubs are just a drive away. 2-year Taylor Wimpey warranty from legal completion.